Hot air balloons from around the world and across Thailand were on display at the grounds at Prince Royal’s College, offering tethered rides in the early evening. The 5th Annual Thailand Hot Air Balloon Festival had its inaugural flights in Chiang Mai on Friday, November 25, 2011 as balloons from Thailand and around the world took flight over the city early in the morning from the grounds at Prince Royal’s College. The evening saw the grand opening ceremony which was opened by the Chairwoman of the TAT Board of Directors, Pensuda Praiaram. Chiang Mai Governor ML Panadda Diskul also took the stage to greet the large crowd in both Thai and English, welcoming everyone to enjoy the hot air balloons, dancing, shows, and the many food stalls on offer from sponsors Le Meridien, Mandarin Oriental Dhara Devi, dusit D2, Holiday Inn, Centara Duangtawan, Imperial Mae Ping, the Royal Princess and Khum Phaya Resort. There was a fashion show, games and rides in the tethered hot air balloons. Chiang Mai Governor ML Panadda Diskul is joined on stage by Chairman of the TAT Board of Director Pensuda Praiaram, Chiang Mai Mayor Tussanai Buranupakorn, TAT Director for Chiang Mai Chalermsak Suranant and Earth, Wind and Fire Co. organizers of the event. Earth, Wind and Fire Co. Ltd organized the event at the Prince Royal’s College and one of their consultants, Yut Wanichanond, is also a hot air balloon pilot, bringing his love of hot air balloons to Chiang Mai. The event takes place at Prince Royal’s College and admission is 50 Baht. There is a light and sound show every evening as well as fireworks. The balloons will take off every morning at 6 a.m. to fly over the city in the cool hours of the early morning. As night settled in the balloons glowed in the evening sky, a light show was on offer later in the evening. Yut Wanichanond, consultant for Earth, Wind and Fire and one of the hot air balloon pilots is joined by Chiang Mai Governor ML Panadda Diskul and Mayor Tussanai Buranupakorn. One of the pilots fills his balloon with hot air as the crowds of children and adults gathered round to watch. The Chiang Mai Provincial Police, City and District Courts, Provincial Administration Organization and the Chiang Mai Municipality forged an agreement to help combat drunk driving in Chiang Mai at the City Court Building on November 23, 2011. Chiang Mai PAO President Boonlert Buranupakorn signed the agreement along with the Chiang Mai Mayor, the head of the Provincial Police and the Courts. The agreement will allow the groups to work together to help forge public awareness of the destructive nature of drunk driving and the fatalities that ensue. A drunk driving awareness campaign will be held at 3 Kings Monument on Sunday, November 27, 2011 to help promote an understanding of the dangers involved. A ceremony to honor HM the King on this, his 84th birthday, will be held on Monday, December 5, 2011 at Tha Pae Gate at 6 a.m. Then the Governor and government officials will be joined by Consul-Generals, Consuls and Honorary Consuls to pay their respects to HM King Bhumibol Adulyadej at Chiang Mai University Convention Center at 8:15 a.m.
Chiang Mai Governor ML Panadda Diskul and other top officials will make merit by offering food and other items to monks as well as to honor HM the King in ritual ceremonies. 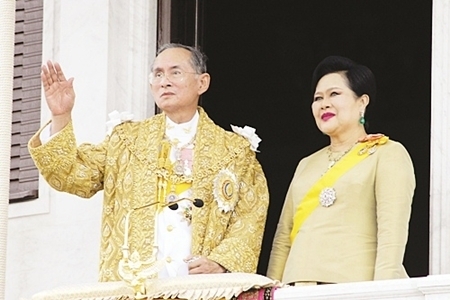 Civil servants, military and police officials will pay homage to HM the King in front of City Hall by preparing a gold and silver donation tree. An International We Love the King Day is scheduled for Saturday, December 3 with a parade of foreigners and Thais who love HM the King starting from Tha Pae Gate at 4:09 p.m. and proceeding to JJ Market where a festival will be held featuring performances of both Thai and foreign artists. 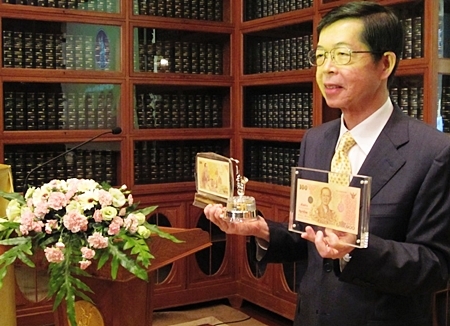 Prasarn Trairatvorakul, Governor of the Bank of Thailand (BOT) unveiled the new commemorative bank notes recently that have been redesigned and will go on sale in honor of HM the King’s 84th birthday. The new notes will feature a different and clearer portrait of HM King Bhumibol Adulyadej along with a different background. The new 100 Baht notes will feature new technology including a gold horizontal bar that will flash as the note is moved and the 100 printed in gold. The notes will be available with commemorative cases and bags at all commercial banks from December 2, 2011. 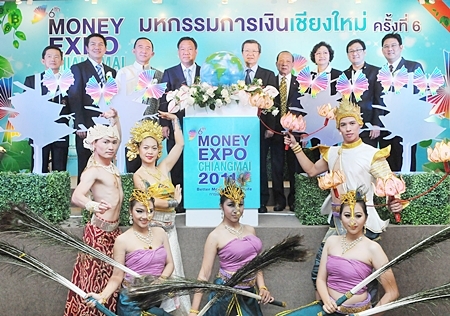 HE Kittiratt Na Ranong, Deputy Prime Minister and Minister of Commerce presided over the grand opening of the Chiang Mai Money Expo 2011 on November 18, 2011. He was joined by Governor ML Panadda Diskul, Deputy Head of the Stock Exchange of Thailand, Bank of Thailand Northern region officials and Chaing Mai Chamber of Commerce members. The Money expo is being held from November 18-20. Chiang Mai is the biggest province in the North in investment and savings, Chiang Mai accounts for 52% of stock transactions conducted in the North or about 11.4 billion baht in the first 9 months of this year. 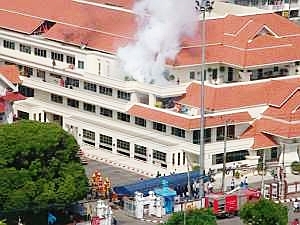 A homemade bomb went off near the entrance of a Chang Moi area guesthouse at 12:30 a.m. on Saturday, November 19, 2011 damaging the building slightly. The guesthouse is located on Soi 1, Thanon Chai Sripoom in Chang Moi. The guesthouse is rented by a 50 year old British man. A neighbor came out after hearing a loud explosion but didn’t see any one at the scene and a CCTV camera nearby did not record the incident. Police are not sure if the guesthouse was targeted or not as the bomb went off in the road. Nobody was injured in the attack and police are unsure as to the motive. Police said neighbors were puzzled by the incident since there are no reported problems. Forensic police are investigating the scene for more information. The police have been enforcing a crackdown in the area on noisy late night venues near the temple. Sunday 20 November 2011 marks the World Day of Remembrance for Road Traffic Victims where all those killed or injured in road traffic accidents are remembered, together with their families, the emergency services and all others affected or involved. According to the Royal Thai Police, in 2010, there were 83,261 reported road traffic accidents in Thailand resulting in 7,468 fatalities plus 14,646 injuries and 3,544 serious injuries. 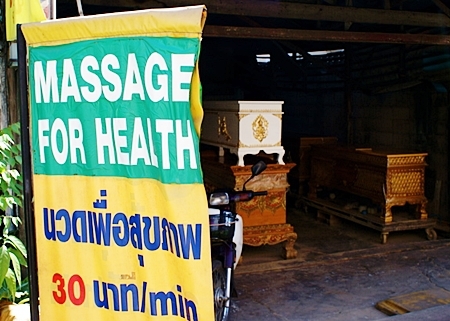 Also in 2010 about 10% of all deaths of British nationals in Thailand were due to road traffic accidents. So far this year 17 British nationals have died in road traffic accidents in Thailand and a further 36 have been seriously injured. About 70% of all road traffic fatalities in Thailand involved motorbikes. On Koh Samui alone there were 7 deaths of British Nationals last year caused by motorbike accidents. British Ambassador Asif Ahmad said, ‘Road traffic accidents have far reaching effects on both the individual and their families. Not all tragedies are avoidable but many lives could be saved and critical injuries avoided, if people took the same precautions abroad that they take at home. Our consular team helps the families of those that die in road traffic accidents and also regularly assist patients suffering from severe head and brain injuries caused by motorbike accidents. Sadly some of these people are left with life changing, debilitating injuries. Their families often have the additional worry of mounting hospital bills as either the motorbike’s engine size or the failure to wear a crash helmet invalidates most travel insurance policies. Sunday 20 November 2011 is The World Day of Remembrance for Road Traffic Victims and is held on the third Sunday of November each year. It is the day on which all those killed and injured in road traffic accidents are remembered, together with their families, the emergency services and all others affected or involved in the aftermath. In 1993 the UK road victim charity RoadPeace campaigned nationally and internationally for appropriate acknowledgement for victims of road traffic accidents and their families. This was adopted by the United Nations on 26 October 2005 and the day recognises that road traffic accident victims and their families deserve much greater recognition. To mark the World Day of Remembrance for Road Traffic Victims the British Embassy Bangkok is hoping to raise awareness of the day and warn people of the dangers of driving abroad. There are over 25 million vehicles in Thailand, a high proportion of which are motorcycles and mopeds. Sadly road traffic accidents in Thailand account for the second most frequent cause of death among British nationals as well as a high number of hospitalisations. The majority of these involve motorcycles and mopeds. Although it is compulsory for the rider to wear a helmet in Thailand, many chose not to do so. Research has shown that holiday makers abroad are most at risk of having an accident just 60 minutes into their first journey. Further information and tips for driving abroad can be found at www.fco.gov.uk/drivingabroad. Visitors to a foreign country are one-and-a-half times as likely to have a serious accident when travelling in a 100-110 km/h speed limit zone as domestic drivers, because of unfamiliarity at driving at these speeds. Familiarise yourself with the local driving laws – including local speed limits. Visitors to a foreign country are twice as likely to have a serious accident as domestic drivers because of driver fatigue. Don’t drive when you’re tired, jet lagged and take regular breaks on long journeys. An international or Thai driving licence is required to drive in Thailand. Travelling by motorcycle, scooter or moped is significantly more dangerous than by car - if you’re not accustomed to riding a motorcycle you should not attempt to ride one for the first time when abroad on unfamiliar roads. Always wear a safety helmet and suitable clothing. The probability of being involved in an accident increases for car drivers when renting a vehicle, but is six times higher for people who hire mopeds or motorbikes. If hiring, rent from a reputable company and check your insurance cover. Some motorcycles or scooters for hire in beach resorts are often unregistered and cannot be used legally on a public road. You could be held personally responsible for any claim for injury or damage if you are not fully covered. Check with your insurance company that you’re fully covered to drive abroad including breakdown recovery and any medical expenses resulting from an accident. Make sure your travel insurance covers you before you decide to drive or be a passenger on a motorbike - check the exclusions carefully. In the UK all drivers and passengers are required to wear a seatbelt and all motorcyclists wear a crash helmet and safety clothing. These simple but life saving measures are all too often forgotten or ignored when abroad. Don’t drink and drive. The legal blood-alcohol limit in Thailand is 50mg of alcohol per 100ml of blood. In the UK, the alcohol limit for drivers is 80mg of alcohol per 100ml of blood. Global Entrepeneurship Week was held at the U.S. Consulate General on Tuesday, November 15, 2011 where a panel of business experts and entrepreneurs discussed keys to success and failure in business startups. The U.S. Consulate General and Chiang Mai Creative City Committee hosted a networking and discussion evening at the start of Global Entrepreneurship Week on Tuesday, November 15, 2011 at the U.S. Consulate. As Consul General Susan Stevenson pointed out, it’s not only the largest event for Global Entrepreneur Week being held in Thailand since the events scheduled for Bangkok were cancelled due to flooding, but the only event! Robert Fox of the Joint Foreign Chambers of Commerce in Thailand came up from Bangkok to meet and talk with local business people and entrepreneurs as did the founder of Imagimax Sirisuk Koshpasharin who talked about his experiences founding the first 3D and animation graphics studio in Thailand in 1998. Araya Laiprawut of Kasikorn Bank talked about SME financing and Sven Ernst, a German entrepreneur who established a branch of his business Buzzwoo! in Chiang Mai recently talked about his experiences with the Board of Investment (BOI). Pinyo Duangcham, a local Chiang Mai lawyer, spoke of the many pitfalls entrepreneurs face and the mistakes they often make, when opening or starting a business in Thailand. Emcee Mr. Smith Taweelerdniti is joined by members of the panel and the Chiang Mai Creative City Committee. Khun Sirisuk was a very entertaining speaker and his story was very interesting for the many young Thai entrepreneurs that attended the event, including a former business student of CMU lecturer Traci Morachnik, who told his former professor that he had started his own business and, at the age of 26, was already doing very well. Mr. Fox noted that opportunities for participating in entrepreneurial endeavors abound, especially in IT. He said that the Joint Foreign Chambers want to foster a “Made in Thailand” brand and in particular a “Made in Chiang Mai” brand where the best and the brightest can come to Chiang Mai. Martin Venzky-Stallling of the Chiang Mai Creative City Committee welcomes Robert Fox of the Joint Foreign Chambers of Commerce in Thailand to Chiang Mai with one of his ubiquitous CMCC stickers. Global Entrepreneurship Week was launched in 2008 by former U.K. Prime Minister Gordon Brown and Carl Schramm, the President and CEO of the Ewing Marion Kauffman Foundation to celebrate and encourage the entrepreneurial spirit. This year saw more than 115 countries participate with millions of people around the world joining in activities and events that help them to learn about opportunities, unleash ideas and build connections. Om Koi was the first Chiang Mai district declared a disaster area this year due to the cool winter temperatures that have recently hit the mountainous regions. Saemoeng was the second district to be declared a disaster area. Temperatures in the mountainous regions have dropped to below 15 degrees Celsius for the past 3 days. Minimum temperatures have reached between 6 and 12 degrees on the mountaintops. At risk include the elderly and children. The Province intends to distribute blankets and warm clothing to the affected areas. A local foreign resident was arrested by police, local media reports, in the stabbing death of Kamol Boonprasert. Police allege that American Gary Alan Cutler age 59 and a former US Army soldier, was at the Caesar Snooker Club on Chang Klan Road on November 11, when he got into a fight with the Thai man. Witnesses say he stabbed the man 3 times during the fight. The man later died from his wounds. The police report that Mr. Cutler confessed to the stabbing but that the Thai man started the fight. Loi Kroh was also the scene of an altercation between local police and a member of the Cobra Gold exercises it is being reported by local media. When enforcing closing times at Loi Kroh area bars and taking photos of the surrounding area it is alleged that one police officer got into an altercation with a U.S. soldier who objected to having his photo taken. It is alleged that in the ensuing fight a gun was pulled and a shot fired into the air. The police officer was taken to the hospital to have his injuries checked and released. He later stated that he was simply trying to protect himself from the 3 Americans. A 22 year old auto mechanic from Pathum Thani was arrested on charges of stealing valuables from customers’ vehicles last week. Police searched his room after a customer filed a complaint over a stolen laptop computer and report that they found mobile phones, digital cameras, the notebook and an Ipod. Police then later arrested a vendor in Waroros Market for receiving stolen goods after the man confessed and gave them information on the buyer. 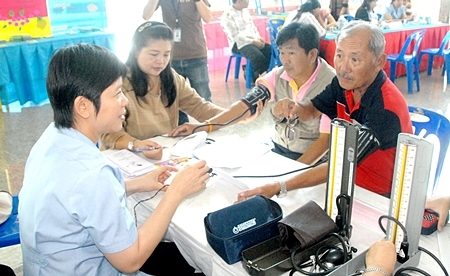 World Diabetes Day was held on Tuesday, November 15 and the Chiang Mai Municipality held free diabetes screening and health checks at the Municipal Building for local residents. Deputy Mayor Nutchudej Wiriyadiloktham attended the event and spoke on the importance of prevention. Health checks included blood sugar tests, eye exams, blood pressure test and BMI measurements. Ian saw this photo on the way to Pai and thought it most apt considering the windy road. Every once in a while we see a sign or a sight that makes us smile, if you see something that makes you smile don’t hesitate to pull out your camera or even camera phone and snap a pic. Send it to [email protected] and be sure to let us know where you saw it. 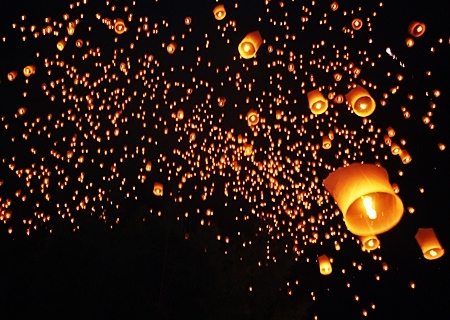 Visitors flock to Chiang Mai to attend the Loy Krathong or Yee Peng Festival, float their Krathong on the river and send their Khom Fai high into the heavens. The Yee Peng Festival, or Loy Krathong as it is called in other parts of Thailand, was not, as reported in the international media, cancelled, instead, Chiang Mai has seen a huge influx of tourists to the town to float their krathongs on the river and moat and to loft their Khom Fai high in the sky, sending this year’s bad luck and problems soaring away. Chiang Mai has remained a destination of choice for Thai people fleeing the floods further South and foreign tourists who wish to enjoy all the culture and beauty that Chiang Mai has to offer. The Yee Peng festival that culminated on Friday the 11th with the Grand Parade and the awarding the King’s Cup for best float is just the start of an action filled calendar for Chiang Mai. Chiang Mai is considered a top destination for tourists visiting Thailand and those who plan to visit should not cancel their plans as Chiang Mai remains dry and has many festivities scheduled. Later this month the International Hot Air Balloon Festival will take place at the Prince Royal’s College; the Royal Flora Ratchaphruek starts December 14 and runs through to March 14. Chiang Mai will have a fireworks display for the New Year, and next year will see the Flower Festival and many more events. The Chiang Mai Municipality headed by Mayor Tussanai Buranupakorn is joined by the Chamber of Commerce at the THAI Air Cargo offices to send food to Bangkok. Chiang Mai Municipality was joined by the Chiang Mai Chamber of Commerce in donating 20,000 sets of prepared food for flood victims in Bangkok and Central Thailand to the THAI cargo area of the Chiang Mai International Airport on November 11, 2011. THAI Airways will carry the food Bangkok. Chiang Mai residents, who suffered two days of flooding over a month ago, have dug deep to donate money and goods around the city. Khun Art of Gap House is joined by the Army on the Sunday Walking Street market every Sunday to raise funds to purchase goods to deliver to Bangkok. Last Sunday, they raised 220,000 Baht to add to the total that has now reached over 400,000 Baht. They can be found on the Sunday Walking Street Market this Sunday the 13th and the 20th. 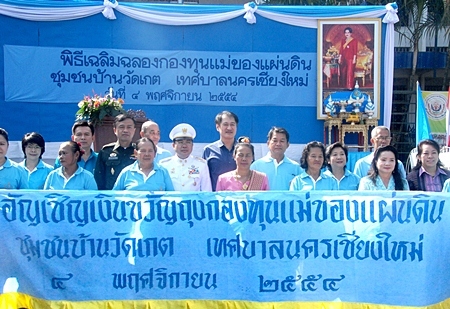 The Chiang Mai Chamber of Commerce recently donated boats and other hard goods to be trucked down to Bangkok. The Chiang Mai Chamber sent boats and other goods to Bangkok to aid residents who have been affected by the flooding. 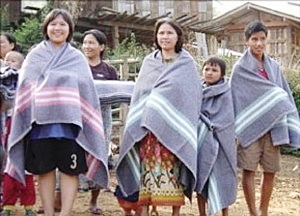 Villagers in the mountainous regions suffer from the dropping temperatures, donations of blankets, sweaters and warm clothing are being taken at the Chiang Mai Airport and the Chiang Mai Zoo. The Chiang Mai Zoo Aquarium has partnered with the Journalists Association of Chiang Mai and the Northern Thailand Hotel Association to solicit donations of warm clothing and blankets to help poor villagers in high mountain areas as the temperatures start to drop. The Thai Meteorological Department has forecast increasingly cool temperatures on mountain tops with lows reaching 13 degrees. While this doesn’t seem cold to many, these temperatures can be deadly for the elderly and the very young as inadequate clothing and uninsulated houses combined with the increase of the costs of firewood due to the recent floods in the North can lead to many poor villagers finding themselves incapable of keeping warm. In addition, cash donations will be used to purchase rice for villagers. Donations of warm clothes and blankets or cash for those in the mountainous Galyani Vadhana District can be made at the Chiang Mai Zoo and at Chiang Mai International Airport, at the office of the Northern Thailand Hotel Association. The campaign will run until December 9 when a caravan of donations will set forth to deliver food and goods to the villagers. Call 08-1671-2592 for further information. Daniel Pruce (right), the Deputy Head of the U.K. mission paid a visit to chat with local residents about the needs facing British citizens in Chiang Mai. Here he chats with local resident Clarence Shettlesworth of Nugent Waterside Resort. Concerned residents have been working with British Honorary Consul Ben Svasti Thomson to form a support network for the elderly and infirm in Chiang Mai. Colin Jarvis pointed out to Mr. Pruce that it consists of all nationalities and will help everyone, not just British citizens. Titled Lanna Care Net, the group is slowly growing in size to help aid ageing foreigners. The government offers classes to Thais, and many residents wives have signed up, to learn how to move an elderly and infirm person, and ways to care for them in their homes. Colin Jarvis (left) and British Honorary Consul Ben Svasti Thomson discussed the emerging Lanna Care Net with Mr. Daniel Pruce of the British Embassy in Bangkok. Mr. Pruce commented on his visit to Dok Kaew facilities at McKean Hospital, noting that they have grown to over 20 patients, many of whom are in hospice care. He said he was quite impressed with the level of care on offer there and that there were not only services for paying patients but for the indigent as well. Daniel Pruce has been stationed in Thailand for 3 years and will be moving on to Madrid for his next post, he said he has greatly enjoyed his stay in Thailand and his visits to Chiang Mai and believes that the Embassy can provide some means of support for people and organizations in Thailand. 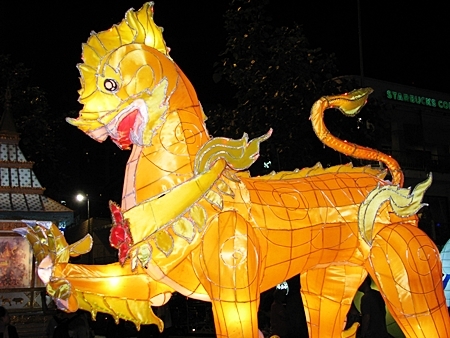 Lantern sculptures were lit on the opening day of the Yee Peng festival on November 6, 2011. The sculptures can be found at every gate and every corner of the moat as well as at the 3 Kings Monument. The lantern sculptures around the city were lit up in the first round of Yee Peng, or Loy Krathong as it is called elsewhere in Thailand, as the city readies for grand celebrations. The first event that took place was the Lantern Parade on Tuesday, November 08, 2011. With the next big event on the 10th; the small Krathong Parade and the release of Khom Fai lanterns at 9:59 p.m. from the city bridges and in front of the Municipal Building. Mayor Tussanai Buranupakorn encouraged everyone to join releasing their Khom Fai lanterns at this time, noting that it wouldn’t interfere with aviation around the city. 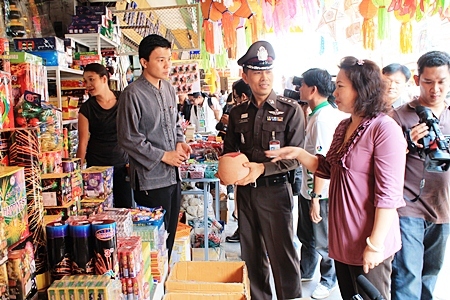 Chiang Mai Police Chief Pol Col Phitsanu Oonhaseri encouraged people to refrain from using the huge fireworks, or bombs as many refer to them, and to respect the no alcohol zones around the moat in a bid to reduce drunk driving accidents and deaths over the Yee Peng holiday. There will be fireworks in honor of HM the King on both Thursday, the 10th and Friday the 11th from the river and the Grand Parade with the Kings Cup award for best float starting from Tha Pae Gate and winding its way to the Municipal Building on the river beginning from 6 p.m. on Thursday, November 11. Other highlights to watch out for include the Kids Contest on Wednesday the 9th, the Dhamma sermon and ceremony for Yee Peng on the 10th at Wat Chiang Man at 6:00 a.m., the ceremony for the White Pagoda and to honor the River Spirits also on the 10th beginning at 8:09 a.m. And of course, the Miss Yee Peng contest with finals taking place on November 10 beginning at 6 p.m. at Tha Pae Gate. There will be Krathong making contests throughout the week, around the moat and at the Municipal building in addition to the many beautiful lighted sculptures that are placed around the city gates, at each corner of the moat and at 3 Kings Monument. 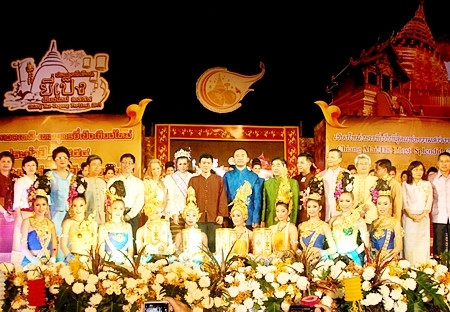 At the Lantern Parade on Tuesday, November 8, 2011, Chiang Mai Governor welcomed tourists and residents alike to the Yee Peng festival and thanked the foreign visitors for their moral support for Thailand by maintaining their plans and visiting the country in its time of need. He added that the Thai people were very grateful for all the support and help that so many people from around the world had offered during this time of crisis. Recent reports of midnight closures of bars along Loi Kroh Road are in line with the recent announcement by Chiang Mai Governor ML Panadda Diskul that the city intends to enforce zoning regulations as residents have complained about noise from entertainment venues on Loi Kroh and Chang Moi roads. Residents of Loi Kroh community filed a complaint with local police reporting intimidation by a Loi Kroh bar owner when making complaints about noise. Police have said that those making threats could be fined up to 1,000 Baht and receive one year in jail. Zoning laws will affect those businesses located next to temples and those found in violation of noise and other laws will be prosecuted. The Governor noted that while the city needs to entertain its visitors, it is also a city of Lanna culture and that culture needs to be respected. The Chiang Mai government has announced a hotline for consumers who feel that unfair pricing practices or hoarding is taking place due to the flooding. Restrictions have been put on prices of many goods and the central government is working to ensure that products such as pork, eggs, poultry and other goods reach the markets and remain at a reasonable price for consumers. Any consumer who feels that there is opportunistic pricing or hoarding should call the hotline: 1569. Japanese Consul General Kazuo Shibata signed an agreement with Ms. Jeeranun Mongkondee, Regional Director for Thailand and Vietnam, PH-Japan to provide funds to aid in the fight against breast and cervical cancer by offering increased screenings and exams to women in Chiang Mai. The Government of Japan, under its Grant Assistance for Japanese NGO Projects, is providing funds for “The Project to Promote Early Detection and Appropriate Treatment of Cervical and Breast Cancer in Chiang Mai, Phase 2” conducted by a Japanese NGO, PH-Japan. 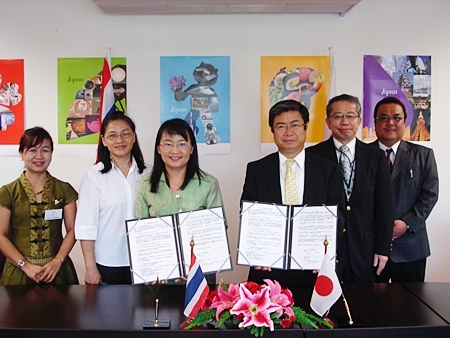 On November 1, 2011, Mr. Kazuo Shibata, Consul-General of Japan in Chiang Mai, and Ms. Jeeranun Mongkondee, Regional Director for Thailand and Vietnam, PH-Japan, jointly signed the funding contract for the Project at the Consulate-General of Japan in Chiang Mai. In Thailand, the leading causes of cancer deaths in women are cervical cancer and breast cancer. Cervical cancer can be detected early and treated with regular screening and appropriate follow-up. A Pap test, which is a screening method for cervical cancer, can help detect suspicious cell changes on the cervix before cancer actually develops. Although regular Pap tests have been recommended for women in a certain age group, the percentage receiving pap tests, especially in rural areas, remains low. For early detection of breast cancer, breast self examination (or BSE), is also recommended to find suspicious changes promptly. However, many women do not know how to perform BSE properly. PH-Japan has been conducting a project for early detection of cervical cancer in Maerim and Maetaeng Districts, Chiang Mai Province since 2008. Based on this experience, PH-Japan will start another project targeting women aged 30-60 in Sansai and Doi Saket Districts in cooperation with the Chiang Mai Provincial Public Health Office. In response to a request from PH-Japan, the Government of Japan has decided to provide funds amounting to 3,645,000 baht for the second phase of the Project. The fund will be used to procure medical equipment, to arrange training for nurses and health staff involved in Pap tests and the introduction of BSE, and to arrange seminars for health volunteers playing a key role in raising awareness in communities. It is expected the same effect as Saraphi and Sankampaen Districts of the Phase 1 term that local public health screening for cervical and breast cancer will be improved and more women will receive Pap tests regularly and practise BSE properly to reduce their health risks. For more information, please contact Mr. Sato, Consul, Mr. Komiya and Mr. Inoue, Staff for Japanese NGO Projects. Consulate-General of Japan in Chiang Mai, 053-203-367. The Mother of the Land Fund awarded Chiang Mai local communities funds to aid in drug prevention on Monday, November 4, 2011. The funds were received by Deputy Mayor Soonthorn Yamsiri at the gates of the Municipal School offices. The Mother of the Land Fund was established after Her Majesty the Queen donated personal funds to support anti-drug volunteers working for the Office of the Narcotics Control Board. The Office used the royal funds as seed money for communities and villages to help them in the fight against drugs. Since Her Majesty is seen as the Mother of the Land, the project was named “The Mother of the Land Fund Village Project”. The Government of Japan is extending Grant Assistance for a Japanese NGO Project, “Establishment of Ecosystem Integrated Farming Villages, Phase 2”, in Yangpian Sub-District, Omkoi District, Chiang Mai Province. 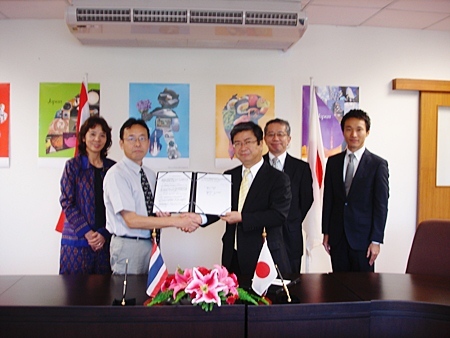 Mr.Kazuo Shibata, Consul-General of Japan in Chiang Mai, and Mr.Hiroaki Takahashi, the Chief Director of Eco Future Fund, a nonprofit organization registered in Japan, signed a contract to this effect on November　1, 2011 at the Consulate-General of Japan in Chiang Mai. Yangpian Sub-District is located in highlands about 1,400m～1,900m above sea level, where hilltribes, such as the Karen, do their farming. However, the reduced traditional cycle of shifting cultivation, deforestation by expanding arable land, and the use of chemical fertilizer for cash crop production have caused landslides, frequent flooding, loss of arable land, decreased water supply, and water pollution. Recently, these environmental changes have been having serious effects on the villagers, with poor crops due to soil exhaustion, health damage to children and pregnant woman from malnutrition and water pollution, and lack of cash income, leading to this area being called “the land that was left behind”. In order to improve the situation, and to secure the villagers’ food, health, and income, the Eco Future Fund project will ensure sustainable development by promoting ecosystem integrated farming for 220 villagers in 5 villages in the Mae Hat river basin, Yangpian Sub-District. In concrete terms, the Fund will give training in farming, agro-forestry, and so on. Moreover,　the villagers who have been trained during the first phase will then be able to practise their new skills in their villages, and pass on their experience to the other villages. At the request of Eco Future Fund, the Japanese Government is funding the workshop, administrative and personnel costs for the second phase of the project. The total amount of the assistance will be approximately 5,688,900 baht. It is expected that the villagers’ living standards and farming environment will be improved and the project will lead to sustainable development in Yangpian Sub-District, Omkoi District through the practice of ecosystem integrated farming. Chiang Mai University (CMU) students were joined by CMU President Prof. Dr. Pongsak Angkasith to fashion EM balls to help treat flood waters in Central Thailand and Bangkok. EM Balls are also called Effective Micro-organism balls, the technology was developed by the Japanese and has been used for various applications, one of which is to disinfect polluted waters.. The flood waters are filled with faecal matter, dead animals, raw sewage, leaked oil and gasoline. It is reported that one EM ball can disinfect 4-square metres of polluted water. Wiwat Sallayakamthorn, chairman of the Institute of Sufficiency Economy, launched the project and requested educational institutes and organizations to help make the balls that consist of clay or mud, molasses and various bacteria developed as part of the Japanese “Kyusei nature farming” system. Northern train services resumed on Saturday October 30, 2011 with the first express train departing Bangkok’ Hua Lumphong Station at 8:30 a.m. and the Chiang Mai –Bangkok Express Train left Chiang Mai at 8:45 a.m. Services were disrupted for a full month to the North due to flooding. The trains are being routed east to avoid flooded areas which will add an hour or two on to the trip. Nok Air moved its operations to Suvarnabhumi Airport and intends to remain there at least until the 10th of November as Don Muang remains heavily flooded, this may be extended. They operate to 9 destinations; Chiang Mai, Phitsanulok, Udon Thani, Ubon Ratchathani, Surat Thani, Nakhon Si Thammarat, Trang, Phuket and Hat Yai. Thailand’s World Cup qualifier against Australia’s Socceroos may be moved to Chiang Mai if the flood waters do not clear by the scheduled date of November 15. Two of the stadiums in Bangkok are currently being used as evacuation centers. Chiang Mai’s 700 Year Stadium meets FIFA standards as it was originally built for the 1995 SEA Games. Chiang Mai Governor ML Panadda Diskul has asked hotel operators to waive change fees for visitors to the Royal Flora Ratchaphruek 2011, which has been postponed to December 14, 2011 due to the floods that have devastated many parts of Thailand. He noted that many Thais are still coping with the disaster and roads, mainly the Asia road, going to the North have been cut off by floods. The Department of Internal Trade noted that provincial supplies of fresh vegetables, eggs and meat were in good shape but added that bottled water and instant noodles were in scarce supply in the superstores. The Ministry issued a warning to all suppliers to refrain from price gouging during this crisis. Suppliers found hoarding goods can receive imprisonment for a term not exceeding 7 years or a fine not exceeding one hundred and four thousand baht or both. If the label does not match the sales price or a price tag that is listed then the seller may be liable to a fine. The Department of Internal Trade has a hotline for consumers; 1569, while the local Chiang Mai numbers are 053-112660 and 053-112661. The world famous Khom Fai or Yee Peng lantern release was held at Mae Jo on October 29, 2011 and while traffic jams and large crowds were part of this Buddhist ceremony, the thrilling site of so many lanterns filling the skies above Chiang Mai made the trek and hustle and bustle worth it to the many who came to the area to release Khom Fai in the first ceremony marking the beginning of Yee Peng. 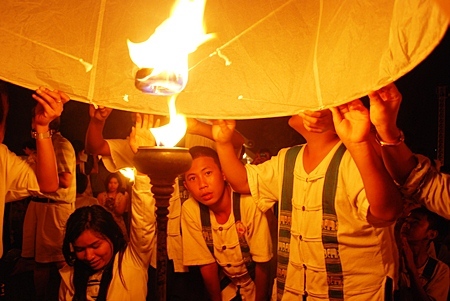 Yee Peng, or Loy Krathong as it is called further south, begins in earnest on November 8, with the Lantern Parade followed by many activities around the city. The Grand Parade is on the 11th of November and starts at Tha Pae Gate and winds its way to the judging stand at the Municipality. Details can be found on www.chiangmai-mail.com or follow us on Facebook: www.facebook.com/chiangmaimail. The Provincial Waterworks Authority is warning residents of possible low water flows from the Meechoke Intersection to the entrance of Mae Jo University on November 2, 2011 from 9 a.m. t 5 p.m. They are flushing out sediment from the system that has accumulated during the monsoon season. Additional work will be done on November 3rd from Kuang Singh intersection to Chang Phuak Gate and low water pressure can be expected for homes and businesses in that area as the Waterworks will be doing pipe repair from 10 a.m. to 3 p.m.
Mr.Kazuo Shibata, Consul-General of Japan in Chiang Mai, and Mr.Hiroaki Takahashi, the Chief Director of Eco Future Fund, a nonprofit organization registered in Japan, signed a contract with Japan pledging funds to the project on November 1, 2011. The Government of Japan is extending Grant Assistance for a Japanese NGO Project, “Establishment of Ecosystem Integrated Farming Villages, Phase 2”, in Yangpian Sub-District, Omkoi District, Chiang Mai Province. For more information, please contact: Mr. Sato, Consul or Mr. Komiya and Mr. Inoue, Staff for Japanese NGO Projects. Consulate-General of Japan in Chiang Mai, Airport Business Park, 90 Mahidol Road, T. Haiya, A. Muang, Chiang Mai 50100. 053-203-367.